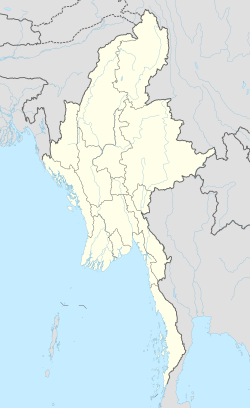 Yenangyaung (Burmese: ရေနံချောင်း; literally "stream of oil") is a city in Magway Region, Myanmar. Yenangyaung is located in central Myanmar on the Irrawaddy River, 363 miles from Yangon. Yenangyaung is the fourth biggest city in Magway Division. There are Yenangyaung Degree College and Yenangyaung Government Technical Institute in Yenangyaung. No(1)Basic Education High School was one hundred years old in January 2015. A beautiful stream called Pinn Chaung flows in the north.General Aung San gathered his secondary level education at this city. The city is divided into Fourteen main quarters. There are many sub-quarters such as Shwe-bone Thar, Ngwe-bone Thar, Yenanthar, Ayesayti, Aungchan Thar.etc.Myoma Market and Yadanar Market are at the center of the city.Industry Zone is located in the north part of Yenangyaung. The principal product of Yenangyaung is Petroleum.It produces most of the oil and natural gas in Myanmar.Yenangyaung also produces a large quantity of edible oil as well as petroleum. Agriculture is also important.The major crops are sesame and groundnut.Other crops are onion, sunflower and beans. Oil wells in Yenangyaung during the early 20th century. For centuries, the dominant industry in the area has been petroleum. It began as an indigenous oil industry, with hand-dug wells; from 1755 onwards, early British soldier-diplomats began to note its existence. In 1795, Major Michael Symes described the indigenous industry as "the celebrated wells of Petroleum". The following year, when Captain Hiram Cox, the East India Company Resident in Rangoon, visited Yenangyaung, he recorded there were "520 wells registered by government". The oil fields at Twingon and Beme, close to Yenangyaung, were in the hands of a hereditary corporation of 24 families, each headed by a twinzayo (တွင်းစားရိုး). In turn, these yo-ya families were headed by 18 men and 6 women twinzayos. The inheritance descended from male to male and from female to female. The word twinzayo is derived from twin meaning well, za, eater or one who derives income from property and yo which represents the hereditary lineal bloodline. The twinzayo could arrange for wells to be dug on their behalf or could allocate well sites to others. In pre-colonial times, these individual well owners, known as twinza were usually relatives of the twinzayo and paid a small monthly rental for their site. The twingyimin, the elected head of the twinzayo corporation controlled the fields, and though a twinzayo could choose the site of a well, digging could not commence until site approval by the twingyimin. During British colonial rule, the hereditary rights of the twinzayo were recognized in the Executive Instructions of 1893. The origins of this indigenous industry remain uncertain, with some claiming that it began as early as the 10th century AD. However, the earliest extant records date to 1755, attributed to an English captain, George Baker, who wrote of an "earth oil town" of 200 families by the Irrawaddy River. In pre-colonial times, wells were dug by hand. Some records estimated that upwards of 1,000,000 US gallons (3,800,000 L) of oil were produced a day in 1797. During World War II, Yenangyaung was the location of a strategically and tactically important oil refinery. As a result of the speed and success of the Japanese advance through Burma during the Burma Campaign and the Battle of Yenangyaung, the retreating Allied forces were forced to blow up the oil fields and refinery to prevent them falling into the hands of the Japanese. This difficult task was left to a small group of men who had experience with explosives and demolitions, some from serving with the Bombay Pioneers, part of the British Indian Army, in World War I. The oil facilities were destroyed at 10 pm on 16 April 1942. This group included Lt. Col. Arthur Herbert Virgin OBE, formerly of the 2nd Bombay Pioneers, who at that time would have been a Captain or Major in the 20th Burma Rifles, which later formed part of the Fourteenth Army under Field Marshal Sir William Slim. He and the rest of the men had to escape through enemy-held territory to Imphal and Kohima in India, a distance of nearly 1,000 miles. This escape included swimming across the Irrawaddy River, as the only bridge had been blown up to delay the Japanese. The Japanese were able to continue using the oilfields, but in the last year of the war as the Allies advanced eastward toward Burma, the oil fields were attacked and badly damaged by Allied bombers. The first bombers to strike were USAAF North American B-25 Mitchell bombers, followed moments later by British Hawker Hurricane fighters, equipped for dive bombing, with long-range tanks, bombs, and 20 mm cannon. ^ Marilyn V Longmuir, "Oil in Burma: The Extraction of 'Earth-Oil' to 1914", Bangkok, White Lotus Press, 2001, ISBN 974-7534-60-6. ^ Hiram Cox, "Journal of a Residence in the Burmhan Empire", Farnborough, Gregg International Publishers, 1971. ^ Report of a Committee Appointed to Investigate the Condition of the Twinza Reserves, Yenangyaung Oil-Field, Burma. Rangoon: Office of the Superintendent, Government Printing, Burma, 1908. ^ Marilyn V Longmuir, Oil in Burma: The Extraction of Earth Oil to 1914, Bangkok, White Lotus Press. ^ Report of a Committee Appointed to Investigate the Condition of the Twinza Reserves Yenangyaung Oil-Field, Burma, Office of the Superintendent, Government Printing, Burma. Rangoon, 1908, 132. ^ a b c d Longmuir, Marilyn (September 1998). "Twinzayo and Twinza: Burmese "Oil Barons" and the British Administration". Asian Studies Review. 22 (3): 339–356. doi:10.1111/1467-8403.00021 (inactive 2019-02-21). ^ Christensen (Summer 1949). "Yenangyaung 1942". Retrieved 1 May 2012. ^ Minute details of this retreat and demolition are found in the first half of "Retreat with Stilwell", by correspondent Jack Belden, Garden City Books, New York, 1943. Defeat Into Victory; Field Marshal Sir William Slim, NY: Buccaneer Books ISBN 1-56849-077-1, Cooper Square Press ISBN 0-8154-1022-0; London: Cassell ISBN 0-304-29114-5, Pan ISBN 0-330-39066-X. "The Desert Rats website". Archived from the original on 29 Jul 2012.